MAN Engines is presenting its solution for meeting the IMO Tier III and US EPA Tier 4 emission standards for commercial use at the SMM trade fair in Hamburg: the modular exhaust gas aftertreatment system (EAT). The EAT offers a high level of flexibility and is extremely compact and lightweight. Its modularity makes a wide range of tailored installation configurations possible as the individual SCR (Selective Catalytic Reduction) components can be positioned differently. “By minimizing the system down to just a few components, it stays compact, regardless of its configuration. Thus the system always proves itself as the optimal solution for our customers, even when to be installed in tight engine rooms,” explained Claus Benzler, Head of Marine MAN Engines. The centerpiece of the SCR is a catalytic converter which helps to reduce the nitrogen oxides (NOx) in the emissions. In order to do so, a 32.5 percent aqueous urea solution (AdBlue) is dosed in a SCR mixer and then injected continuously and directly into the exhaust tract. The solution then reacts with the nitrogen oxides and converts them into water (H2O) and harmless nitrogen (N2). This method of SCR injection does not involve compressed air, saving again more space, reducing the technical complexity and installation space required for this already extremely flexible system. 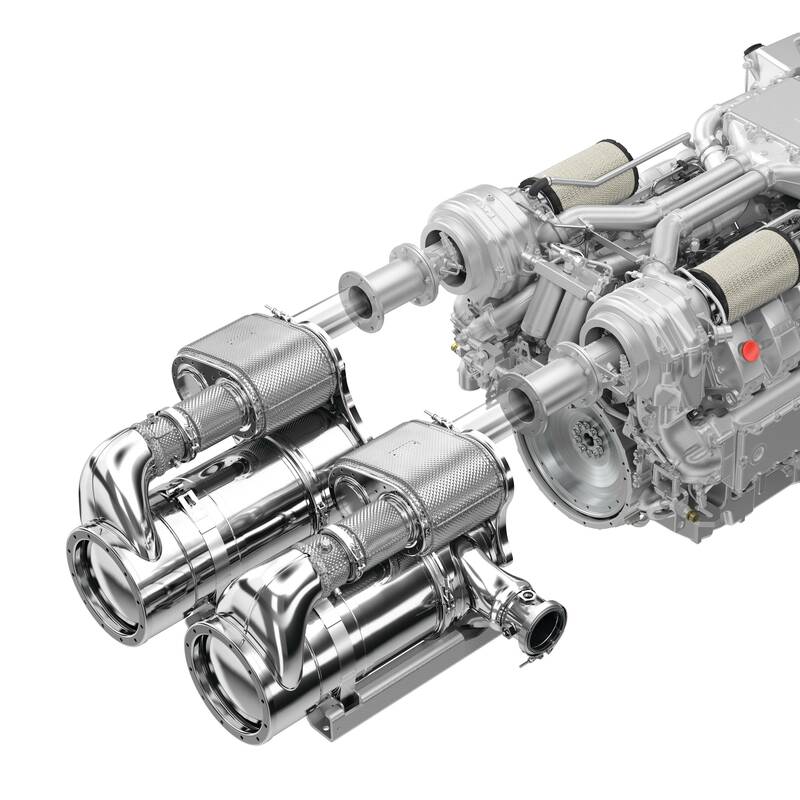 MAN Engines noted that the system saves additional costs and makes the system less complex as a whole as the modular exhaust gas aftertreatment system is a modern SCR-only system, which does without exhaust gas recirculation as well as bulky and heavy components like diesel particulate filters and oxidation catalytic converters. Together with the optimized combustion of MAN engines, the SCR catalytic converter meets the requirements of both emission levels IMO Tier III and the US EPA Tier 4. Using the SCR means that specific fuel consumption– was additionally reduced by up to 8 percent per engine while still maintaining the same power. The foundation of the system is a result of the expertise at MAN Truck & Bus AG, which has been using SCR systems in the group's own trucks in high-volume production since 2006. Furthermore, MAN Engines also benefits from the experience of fitting and installing after exhaust treatment systems gained in the agricultural and industrial sectors. Here the technology has been used since 2015 for in-line and V-engines. Also, the SCR system is currently proving its practicality in field trials for commercial workboat applications. As a result, the engines from MAN Engines for workboats are already equipped to meet the IMO Tier III emission standard, which will be mandatory from 2021 on. This standard stipulates a reduction in nitrogen oxides (NOx), depending on the engine’s maximum operating speed, by around 70 percent compared to its predecessor, IMO Tier II. Instead of the 7.7 g/kWh permitted previously, only 2.0 g/kWh will be allowed in the future. At last year’s International WorkBoat Show in New Orleans, MAN launched its SCR system, optimized for work boats and designed to meet the U.S. Tier 4 emissions standard. This standard permits a nitrogen oxide limit value of 1.8 g/kWh and 0.04 g/kWh for particulate emissions, and has been in effect since October 1, 2017 for all U.S.-flagged commercial vessels with an output of more than 600 kW (816 hp) per engine. This equates to a reduction in nitrogen oxides of almost 68 percent compared to the previous U.S. Tier 3. 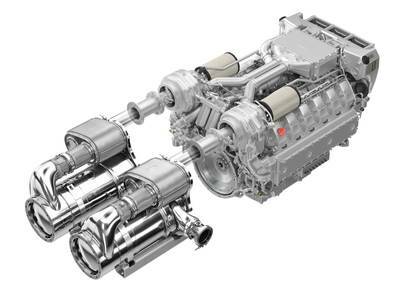 With its 12-cylinder engines, MAN Engines currently offers a consistent range of outputs from 551 to 1,066 kW for the U.S. Tier 4 emissions standard and up to 1,213 kW for the IMO Tier III emissions standard. This portfolio will be continuously expanded to include other power outputs.